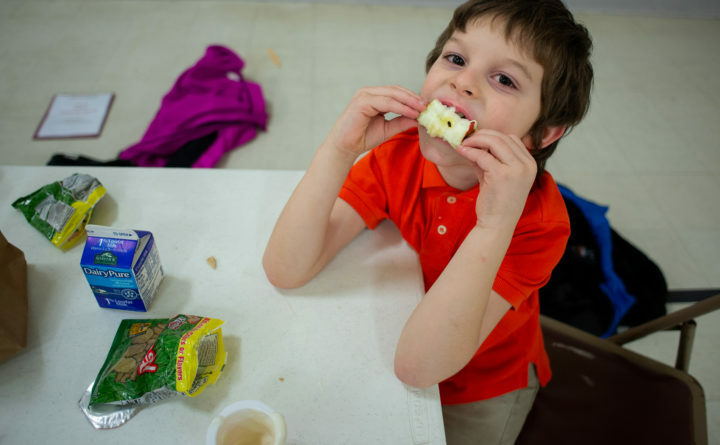 Austin Gogan, a second grader, enjoys an apple at the after school meal program at the Boys and Girls Club. Catherine Myatt, the executive director of the Boys and Girls Club of Bangor, wasn’t sure that offering an after-school meal every day was a good idea. But the first day of the organization’s new after-school meal program convinced her it was. Students participating in the Boys and Girls Club’s after-school program started receiving a free meal every afternoon this past October. The meal comes to the students through a partnership with Good Shepherd Food Bank, which started sponsoring the after-school meals at the Boys and Girls Club and at Bangor’s Fairmount School. On the first day, Myatt said, a boy asked her if he could take his allotted brown bag home. Myatt asked him why, and the boy told her he wanted to share the meal with his family because they didn’t have any food at home. 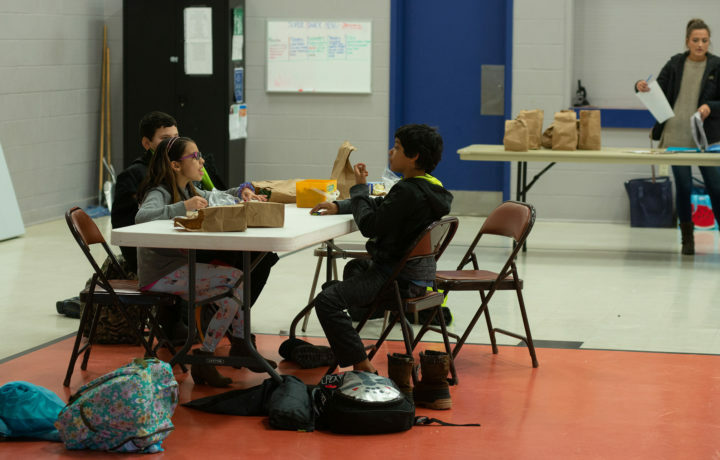 At the Boys and Girls Club, more than 50 students, primarily from Fairmount and Downeast schools, come to the club for the meal and activities every day after school. Students from Fairmount, who are in fourth and fifth grades, split their week between attending after-school activities at their school and at the club, Myatt said. Students participating in the Boys and Girls Club’s after-school program started receiving a free meal this past October. Children receive free food — often sandwiches with fruit, vegetables and milk — while a tutor helps with homework. Later, they split into groups for educational games, sports or crafts. The food bank had already worked with the Boys and Girls Club of Bangor and Fairmount School to offer meals during the summer, and it decided to sponsor the same sites for an after-school meal. Good Shepherd Food Bank sponsors the dinner under the federal Child and Adult Care Food Program. Staff at the program sites prepare the meals, Good Shepherd pays for them, and then the food bank receives reimbursement from the U.S. Department of Agriculture. Good Shepherd Food Bank handles the paperwork and makes sure the program follows federal regulations. 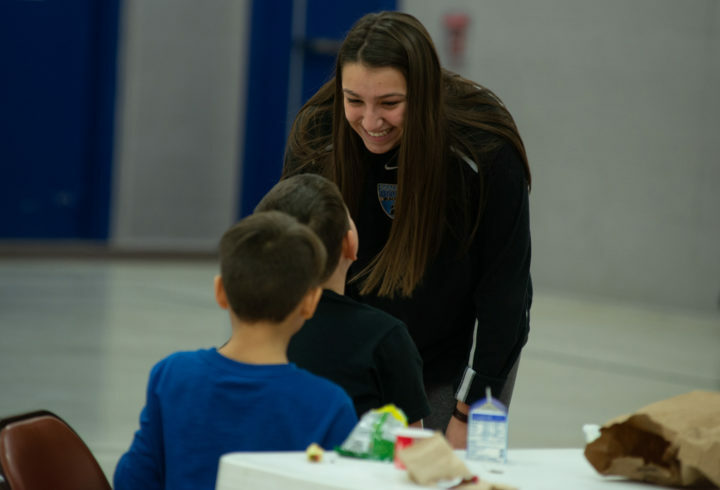 Grace Hamel, after school staff at the Bangor Boys and Girls Club, shares a laugh with a couple of kids during their after school meal on Friday. Students participating in the Boys and Girls Club’s after-school program started receiving a free meal this past October. Tiffany Lindsey, who oversees after-school programs at Downeast, Vine Street and Fairmount schools, said she had a similar experience to Myatt when Fairmount started offering a full meal to supplement after-school snacks. A student told her that having dinner at school meant her mom had one less meal for which she had to shop. “This is giving them enough energy to get through after-school activities, but some of them have expressed to me that that’s also their dinner for the night,” Lindsey said. 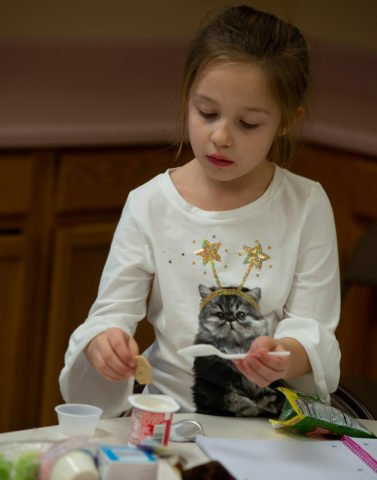 Isobel Russell, first grade, enjoys a yogurt at the after school meal. Many students in Bangor have lunch before noon, and are often in school until after 5 p.m. for after-school activities, Coffin said. Making sure that no child is hungry for an extended period of time was an important factor for the food bank in deciding to sponsor the program. Fairmount, Downeast and Vine Street schools all have enough students from low-income families that they qualify to offer free meals, reimbursable by the USDA, to all students, including those from families that don’t qualify for free and reduced-price lunches. The Bangor School Department is contemplating ways to offer full meals during its Downeast and Vine Street after-school programs as well, Lindsey said.